Delays in recognising deterioration or inappropriate management of people in acute care settings can result in late treatment, avoidable admissions to intensive care units and in some instances unnecessary deaths. As the role of the nurse in healthcare settings continues to change and evolve, today’s student nurses need to be equipped with the fundamental skills to recognise and manage deterioration in the patient in a competent and confident manner, as you learn to become practitioners of the future. 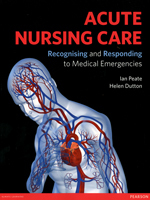 Using a body systems approach and emphasising the central role and function of the nurse throughout, this book provides a comprehensive overview of the essential issues in this important subject. Topics covered include: recognition and identification of physiological deterioration in adults; identification of disordered physiology that may lead to a medical emergency linked to deterioration of normal function; relevant anatomy and physiology; pathophysiological changes and actions that need to be taken; immediate recognition and response; investigations, diagnosis and management issues; and teaching and preventative strategies.